Guderian’s breakthrough at Sedan on May 13th seriously unnerved the French government. At 7:30 in the morning on May 15th, Premier Paul Reynaud awoke Churchill with the desperate news, “We are beaten. We have lost the battle. The road to Paris is open.” Reynaud then confessed that he was considering giving up the fight, but Churchill was able to calm him down, & the next day the British prime minister flew to Paris to meet with Reynaud, Daladier (then defense minister), & General Maurice Gamelin, the French commander in chief. Gamelin had so badly underestimated the threat posed by Germany’s Panzer divisions that two days after this meeting with Churchill, he was dismissed. Reynaud replaced him with General Maxime Weygand, another aging hero of the First World War, & also brought into his government as vice premier eighty-four-year-old Philippe Pétain (so that the French might be inspired by the memory of Pétain’s courageous defense of Verdun). However, neither Weygand nor Pétain believed that the German offensive could be stopped, & Pétain even used his new position to lobby quietly for a separate peace. As best he could, Weygand established a new defensive line along the Somme & Aisne Rivers, but with only sixty-one weakened divisions, few tanks, & no permanent fortifications, it simply couldn’t hold. On June 5th, the Germans threw ninety-five divisions against the “Weygand line,” which broke quickly, allowing German armor – flanked by hundreds of Stuka dive-bombers – to speed south nearly at will. On June 10th, Reynaud’s government fled to the French capital for Tours (& later Bordeaux), after which Paris was declared an open city so that it might be spared the torture suffered previously by Warsaw & Rotterdam. The Germans marched in on June 14th. In Bordeaux, Reynaud wanted to continue fighting from France’s colonies in North Africa, but Pétain & Weygand – along with a majority of the cabinet – insisted on an armistice. Therefore, on June 16th, Pétain replaced Reynaud & early the next morning sued for peace. 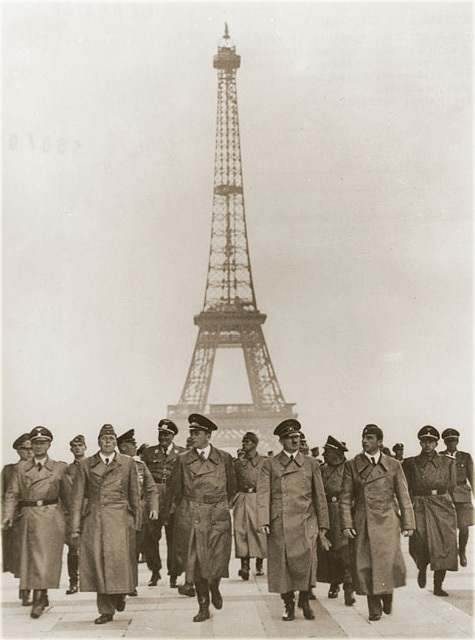 On June 21st, determined to humiliate the French, Hitler accepted their surrender in the same railway car near Compiègne – removed from a museum for the occasion – in which the Germans had capitulated at the end of World War I. The terms of the armistice, dictated by Hitler, provided for German occupation of the northern two-thirds of France, the remainder of the country to be governed by a new French authoritarian regime led personally by Pétain & headquartered in the southern spa city of Vichy. Roosevelt; however, had no intention of abandoning his “Europe first” strategy & immediately sent the two chiefs to London to work things out with the British. When Churchill proved adamant, Marshall & King, following Roosevelt’s instructions, acceded to the North African landing, now code-named Torch. If the two chiefs of staff were perturbed by the shelving of Bolero, their agitation was niggling compared to Soviet premier Joseph Stalin’s outrage. In the wake of the PQ 17 disaster, Churchill had already halted the Arctic convoys, & now the second front in France that had been promised for 1942 was also disappearing. Meanwhile, the Germans were once again on the move, advancing on Stalingrad & punishing the Soviets, who continued to bear by far the heaviest part of the fighting against Hitler. Unless the British & Americans became more actively involved & soon, Churchill feared, Stalin might well choose to seek a separate peace. 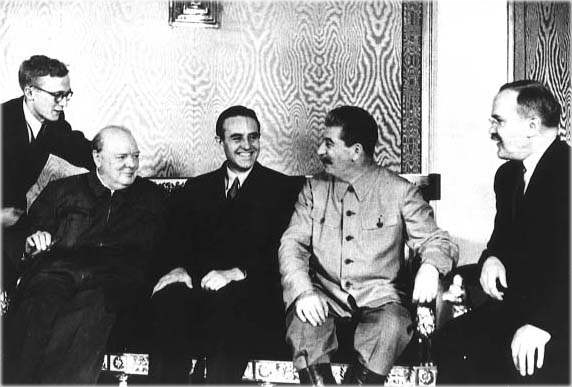 Therefore, the British prime minister decided to visit the Soviet leader personally & use his considerable diplomatic talents to improve, as best he could, Stalin’s morale.